Your free Xbox 360 Gears of War games will have to wait a bit. 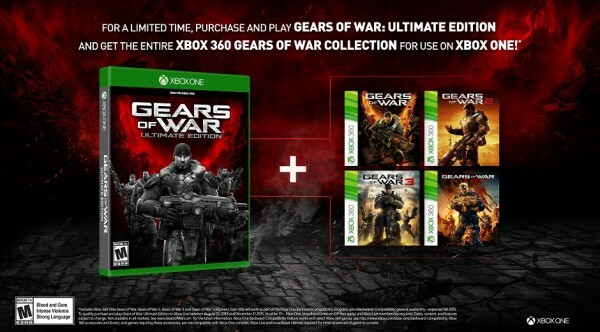 If you remember, Microsoft announced that anyone who plays Gears of War: Ultimate Edition between August 25 and December 31, will get a token to download the entire Xbox 360 collection on Xbox One through backwards compatibility. Today, the company revealed the full list of backwards compatible games launching with the program. The list of course included all Gears of War games, but it appears those claiming the Ultimate Edition offer will be getting the games a bit later. Starting December 1, anyone with a copy of Gears of War: Ultimate Edition and has played the game at lest once on Xbox Live since launch, will see Gears of War, Gears of War 2, Gears of War 3, and Gears of War: Judgement on their Ready to Install list on Xbox One. You can still take advantage of this offer if you play the Ultimate Edition before December 31.